Harry Potter and Whichever-It-Is... Okay, it's Harry Potter and the Deathly Hallows, part one, opens today in theaters across the nation. And the world. Although none of the books ever mention the United States, so we're to assume the only witches and wizards are either British, French, or Russian. And none of the books mention Marmite, either. I usually celebrate in some sort of way by making a treat, typically pumpkin pasties. I even have a crapton of pictures of the spread I assembled, complete with a jar of Marmite that I haven't since touched, from an "after the Deathly Hallows book release fiesta" that I've never developed. I'm not even a huge Harry Potter fan. I didn't swoon when Robert Patterson decided to eff the wizarding world after being destroyed by Voldemort by becoming a vampire. "Yeah, take that, Harry! Forget your scar -- I sparkle in the sunlight." So anyway, again, my mom was throwing the idea around of creating a homemade butterbeer centered around our new favorite fall-flavored tea, Bigelow's Pumpkin Spice Tea. 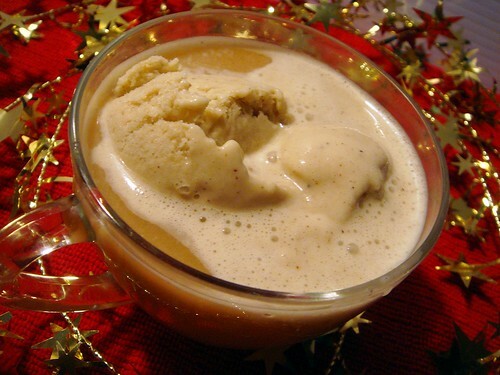 The version of butterbeer we make uses vanilla ice cream blended with brown sugar-and-spice mixed in butter, scooped in a mug, and topped with hot apple cider. Well, we had no ice cream. But why not make our own? And so I did. I could have done that spell Hermoine does where she makes recipes come together. (Doesn't it bother you that this "spell" only works if the ingredients are present -- meaning, they have to originate from in the flesh and be in the same room instead of appearing from thin air? That's not magic, folks.) But instead I used regular cooking skills. Mom had the idea of using a can of coconut milk, as the higher fat content would erase the need of the butter. I quickly cracked and separated egg yolks from whites, whisked with sugar, then added whole milk and a can of whole coconut milk in a saucepan. With a pinch of salt and various spices, the custard was on its way, slowly heating up to a thickened mixture. I debated just using coconut milk, but I wasn't sure if it'd turn out too icy. However, I'll try it again since it'd have been lactose free. Once that was set, I ended up refrigerating the custard overnight. You can then freeze according to your ice cream maker's instructions, or do the caveman version of pouring the custard into a wide container with decently high sides, freeze, and stir in 15 minute increments. Referencing my old ice cream post, the increments between stirring were longer. Maybe this was because the custard wasn't as chilled, but more room temperature, and then I realized I had followed David Lebovitz' instructions. So check earlier or check later, you decide. The ice cream came out incredibly delicious, thought with just a subtle hint of coconut. Not too sweet, yet sweet at the same time. Next step was to brew the tea, sweeten just a tad (1 teaspoon sugar per cup), then pour over the ice cream scooped inside a mug. 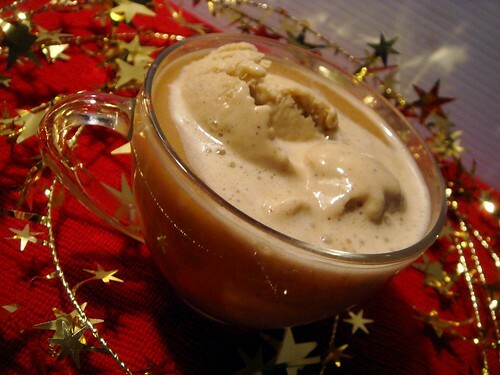 What you get is a delicious foam as the ice cream melts from the hot tea. Eventually, the entire cup becomes cooler. I liked the way it tasted, though I think the apple cider gave it a rounder taste. Until most of the ice cream had melted, it still tasted a little watered down, but not bad at all. What I would suggest is to brew the tea at double strength and sweeten more, or steep the tea bags in heated apple cider. Definitely try this out if you're looking for a fun spin on your Harry Potter party. Whisk together egg yolks, sugar, and salt in a medium saucepan until combined. Slowly pour in both milks, whisking to combine. Stir in the spices. Turn the heat up to medium and cook, stirring almost constantly, for 5 minutes. Add the cinnamon stick, which will steep during the remaining cooking time. Continue cooking until the custard thickens, around 5-10 minutes. To test, it'll coat the back of a spoon and won't bleed into a line drawn through the center. Immediately remove from the heat and pour into a plastic bowl. Let cool to room temperature; cover, and refrigerate overnight. 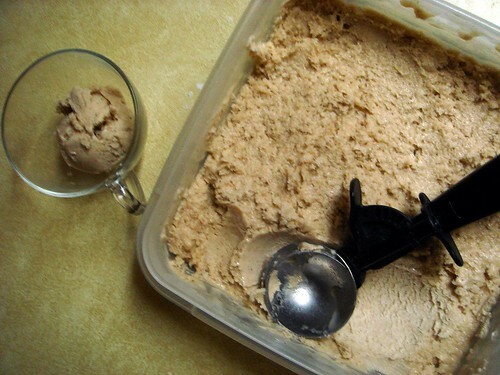 Freeze according to your ice cream maker's instructions, or pour into a deep container. Place dish in the freezer. In 20 minutes, take the dish out and stir the ice cream. It'll have begun to freeze around the sides. Make sure you mix thoroughly so the custard is all once consistency. Return to freezer, and repeat every 15-20 minutes, totaling 1 hour to 1 hour and 15 minutes. Cover, and freeze until eaten. 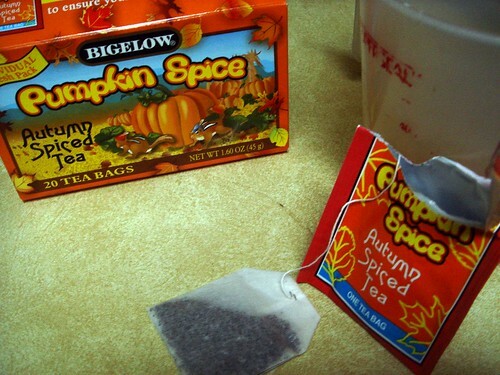 Brew a tea bag of Bigelow's Pumpkin Spice Tea in a cup of heated apple cider. Stir in a teaspoon of sugar. Scoop some ice cream into a mug, then pour the tea on top. Stir with your fake wand that is the equivalent of a fake Star Wars lightsaber. Enjoy! oh yum! this sounds awesome!! hehe. i've enjoyed reading the books but am not so crazed that i make my own butterbeer at home after running to the theater the day it comes out :) but i love the sounds of this ice cream! spices and coconut are my two favorite things on this planet. Thanks for the recipe, going to attempt to make some this Thanksgiving. Glutster ~ I remember you saying that about the coconut rooibos cupcakes. I find myself trying to use coconut as often as I can, heh. Hope it goes well and happy holidays! Sounds pretty convenient! The spices pair nicely with the taste of the coconut, especially if you prefer a more seasonal flavor. I hope you like it if you try it!